Besides seating arrangements and choosing the type of chairs to be deployed at an event, there is another aspect to be addressed by any event planner—well-dressed seats should amplify the grandeur of the overall décor and complement its color scheme. This is why hotel managers, restaurant owners, banquet hall organizers, and party planners choose event seating accessories like Chair Sashes. Whether event chairs are lined-up at an outdoor wedding or stacked for hosting a corporate lunch, every guest hosting area needs sophisticated chairs. 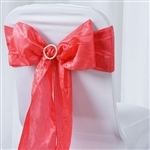 With Econoline Crinkle Taffeta Chair Sashes, event organizers can ensure that the seating matches the décor, complementing the primary color scheme for the event. Useful in nearly any event space that needs chair decorations that add to the personality of an event, meaningful for every guest hosting space, these crinkle taffeta sashes have great aesthetics. 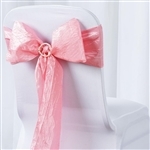 Any Event Seating Can Use Econoline Crinkle Taffeta Chair Sashes! Event seating has more than just the kind of floor space it occupies, back support or seating width—the presentation matters too. 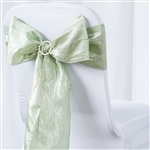 Found at nearly every catered venue, crinkled taffeta chair sashes get the leverage of a fabric that does not stain or fold easily, and has a bit of lustrous exterior too. The sashes are useful for outdoor catered events, ranging from celebrations arranged in the garden or courtyard, recommended for seating around any type of food table, including buffet tables. Available in a wide range of colors, Econoline Crinkle Taffeta Chair Sashes can be used to add glamor to event tables at stage or auditorium gatherings too, seats at industry events, boardroom-style seating, and seating for catered events. Why buy Commercial Grade Table Linens like Taffeta Chair Sashes from RazaTrade?